Three juried paintings of mine will be on exhibit this Friday, September 2, 6-9 pm, at The Cornell Museum's September Art Walk. The museum will feature artwork by the Delray Art League. Stop by the museum to view the exhibit, enjoy some wine and light bites, and then continue on to the rest of the galleries in Delray! First Friday Art Walk is an open house hosted by the art galleries in downtown Delray Beach. Enjoy an evening of art, education and relaxation in this award-winning Arts Town! Welcome to Downtown Delray Beach's First Friday Art Walk program! This self-guided tour and year-long event invites you to explore the heart & soul of our art scene on the First Friday of every month. Enjoy art galleries and working studios while you meet with many talented, local artists. Stroll and enjoy beautiful evenings in Downtown Delray as you navigate your way through myriad styles of art. The Art Walk features three artistic areas; Atlantic Avenue, Pineapple Grove and Artists Alley. Check out First Friday Art Walk Brochure for more details. Monday-Thursday 9:00 a.m. � 9:00 p.m.
Friday & Saturday 9:00 a.m.-6:00 p.m.
Sunday noon � 6:00 p.m.
Karen tells The Rickie Report, �Until about 10 years ago I was painting mostly landscapes and animals. Although I enjoyed the subject matter I needed a niche that would set my work apart. I asked myself what is it that I love to paint and never tire of. The answer was �cats�. I find them truly mesmerizing, magical creatures. I never have far to look for inspiration. Ideas come to me as I watch my own cats and just let my imagination loose as I am continually charmed by them�. 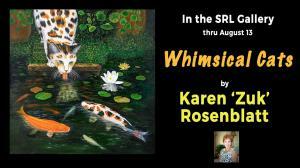 Karen Rosenblatt, a former pianist and teacher, transitioned to art after a strained finger forced her from the concert stage.��I can say that the creative spark finds a way to go on� Just let it burn�.�Her father, a commercial artist/illustrator,�passed on and left her his supplies. She took his signature (�Zuk�) a shortened version of the family name (�Zukoff�) and began her journey. Karen has had one-woman shows, exhibits in galleries, museums, outdoor shows and online venues. She has won awards in watercolors, oils, pastels and photography and her work is in collections worldwide. �Memberships include The Delray Art League and The Artist�s Guild of the Boca Raton Museum of Art (Signature Member and past Executive BOD). Although most of her work is realistic she enjoys adding a bit of humor (realism with a twist). Animals (especially cats) are her favorite subject, and her hope is that people who see her work will be inspired to treat them all with kindness and dignity. ��I soon realized that my love for cats was the constant evolving inspiration for most of my work. I particularly enjoy sharing their beauty, mystery and whimsical nature�. 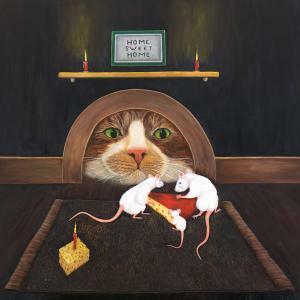 "In her meticulously constructed paintings, Karen presents the viewer with the zany and mischievous world of cats.�While her playful perspectives are amusingly distorted, the narratives created are refreshingly familiar.�Her�painting demonstrates the artist�s true ability to capture exciting concepts. It strays from an adherence to the�pseudo-reality of photographic work and dashes into the realm of the artist�s imagination�.